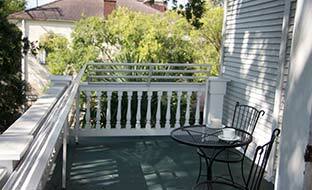 The Queen Anne is located in the heart of the Garden District, one of New Orleans' most historic neighborhoods. An elegant 1890's Victorian mansion, it is a prime example of the spacious homes built by Americans who settled the area following the Louisiana Purchase. 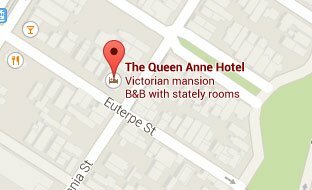 To gain an appreciation for old New Orleans, reserve one of the quiet and spacious rooms in the Queen Anne, an elegant Victorian mansion that has been restored to its original grandeur. Decorated with magnificent mirrors, elegant carpets and a 15 foot tapestry overlooking a sweeping center staircase, The Queen Anne Hotel combines the best of ninteenth century charm with modern amenities. The hotel, with its steep gabled roof, asymmetrical shape and dormer windows, is named for its syle of architecture, dating from 1880-1910. Most of the hotel's dozen distinctive rooms are appointed with the original coal burning fireplaces for effect only, showcasing the original ceramic tiles beautifully restored and the hand-carved fireplace mantels. 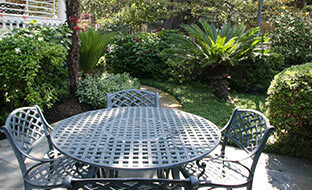 Each room has either custom made mahogany or antique pine furnishings. The draperies are coordinated to designer wallpapers and color palettes, accompanied by glass transoms, Red Heart Pine floors or wall to wall carpet and marble bathrooms. For a closer look at the our room offerings visit our photo gallery.